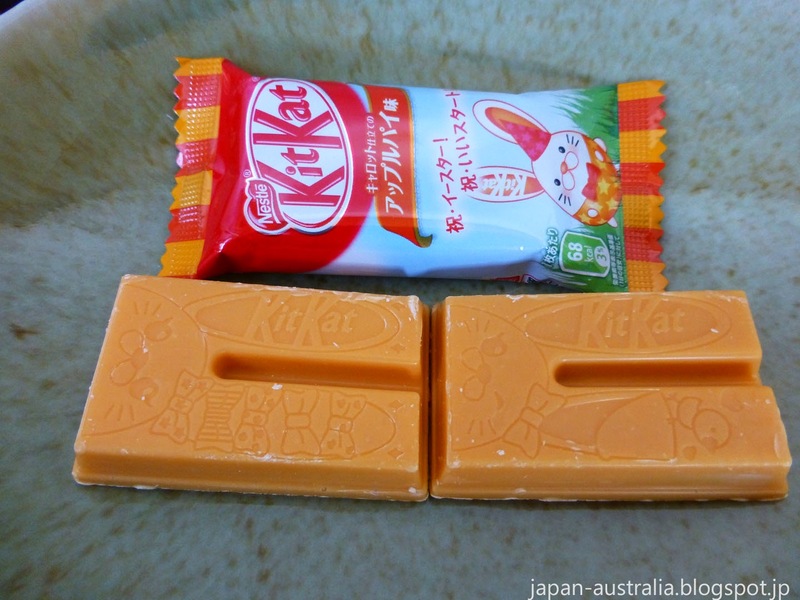 Kit Kat is a popular snack in Japan well known for its unique flavours and limited edition releases. You can pretty much find any flavour of Kit Kat here in Japan if you look hard enough. Each area seems to have its own regional variety and you can find limited seasonal releases for annual events and holidays such as Christmas, Halloween and the Cherry Blossom season. Easter is not a major holiday in Japan but it has slowly been gaining in popularity in recent times. 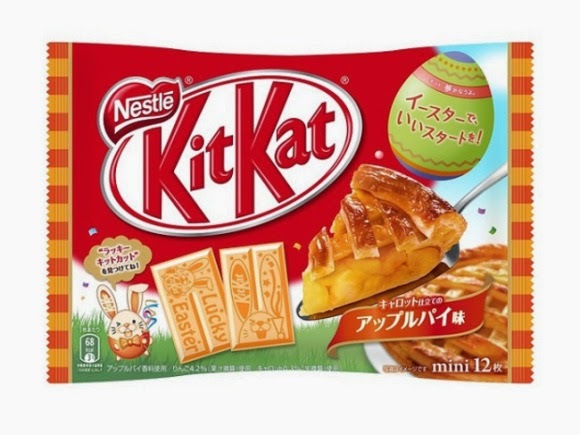 This year, Nestle Japan has launched a brand new version of Kit Kat just in time for Easter. 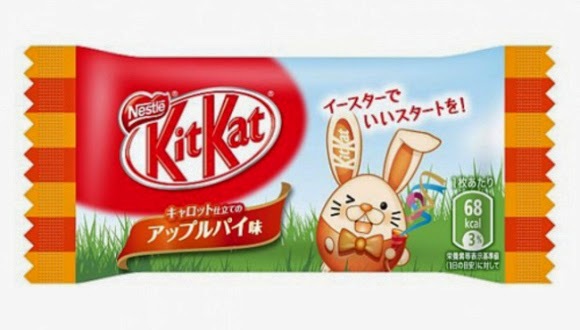 The Easter Kit Kat features a cute package with your typical Easter images like the Easter Bunny and an Easter Egg. 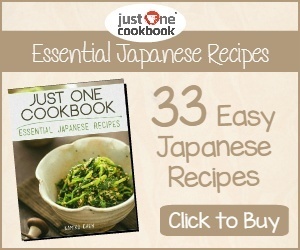 It also features a fun play on words that is perfect for April in Japan. Nestle Japan has the slogan イースターでいいスタートを! (iisutaa de ii sutaato wo), which means “Have a good start with Easter” in Japanese. April is the start of the Japanese school and business year so it is a perfect slogan to run with this time of the year. 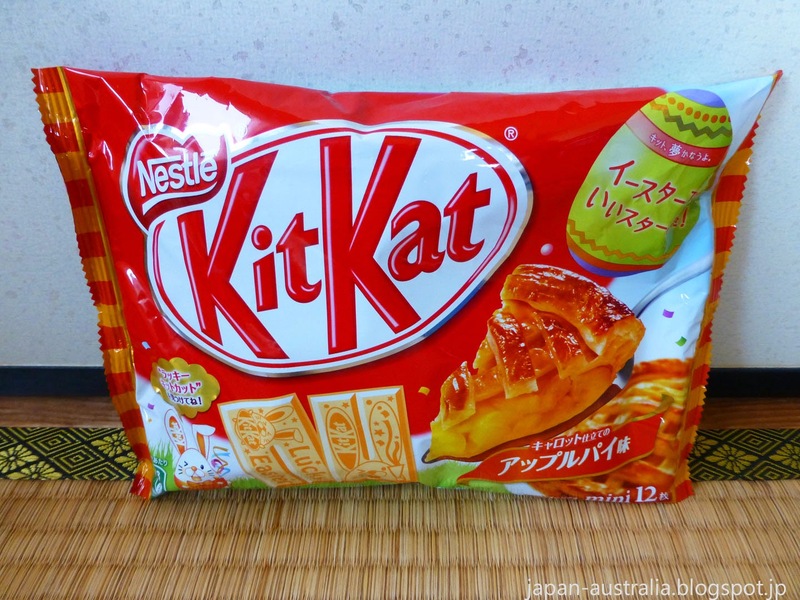 The new Kit Kats are apple pie and carrot flavour which is an interesting combination. Why apple pie and carrot you ask? Well, Nestle Japan came up with the combination after surveying Japanese chocolate fans and asking what flavours they would most like to see. Apple and Carrot topped the list, so the rest is history as they say in the classics. We were very curious so had to go and check them out. They went on sale from March 16 and will be available for a limited time. You can pick up a pack of 12 for 540 yen (USD$4.50). Opening up the cute package you come across these even cuter individually wrapped Kit Kats. 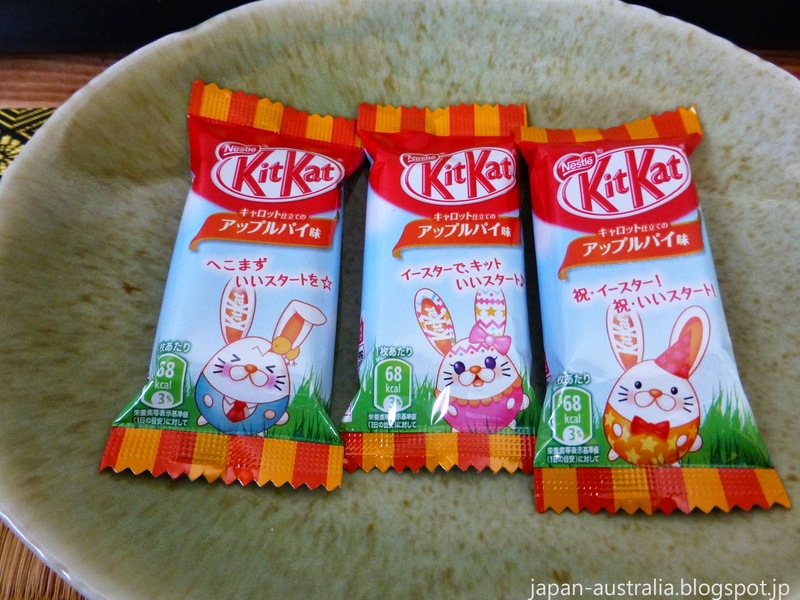 The Kit Kats themselves are also cute with different designs on them. There are thirteen different designs in total to feast your eyes over this Easter. 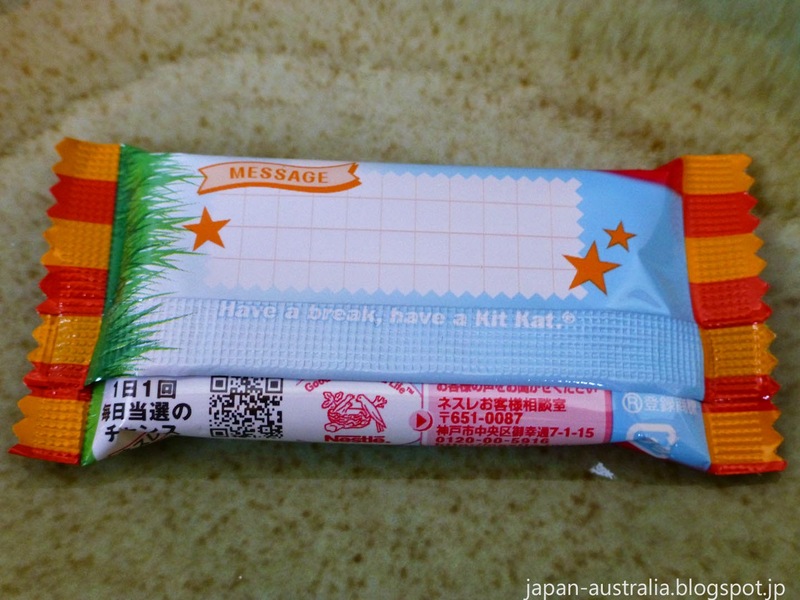 They also make a cool Easter gift with space on the back of each Kit Kat to write your Easter message. How do they taste? Well, I’ve heard some interesting answers on Twitter ranging from tastes like medicine to apple juice. They don’t taste that bad, but I wouldn’t say that they are one of my all-time favourites. The apple pie flavour is quite strong and doesn’t match up well with the chocolate in my opinion. Still they are worth a try if you are curious and want a new variety of Kit Kat to try. They're crazy about Kit Kat over here, aren't they. I'm not sure apple and carrot would have been at the top of my list though. Still, I'll have to check it out before I make a judgement. Has anyone been to the Nestle Kit Kat boutique, yet. It opened this year, in Ikebukuro, Tokyo, I believe. Thanks Tom! They sure are! We are spoilt for choice here in Japan. I've yet to visit the Kit Kat Boutique in Tokyo. Did you know they also opened up one in Nagoya and Kyoto? Thank you! We have many different seasonal Kit Kat here in Japan.